This coming Sunday is the Detroit Women's Half, and I will be running it. I decided to sign up for this race shortly after I really got into running. I had run a 5K and while I was pretty pumped to finish the race, we've already discussed my frugalness how cheap I am, and while the bright yellow Hanes cotton t-shirt was a neat? It was decidedly...less than bitchin' swag. Sure, there was fitness, camaraderie, some pancakes and all those high-fives at the finish line, but if I'm forking over my cash, I want more. Medals. Tech shirts. Awesome stuff. I needed to run longer races. Longer races come with stuff. Right after I found out about the Women's half I picked up an issue of Women's Running with a 14-week 1/2 Marathon plan. I was almost exactly 14 weeks (13 weeks and 3 days) away from the race, and I've tried my damnedest to stick to that plan. Sadly, one work trip and some crazy shin splints cut my long runs short twice, meaning that 10 miles is the longest I have ever run. And this Sunday I need to run 13.1! A friend told me to just pretend that I'm running a 5K, and since I know I can run 10 miles, pretend that the 10 miles is just a warmup for the last 3.1 miles. Clearly, my friends are super nutty. Since I'm only a week away and I know I can't run an 11 mile long run and still be ready for 13.1 miles this weekend, I did what I thought was the next best thing. I've run twice this week on what will the race course. I went back to Belle Isle. And played with the panorama on my iPhone, clearly. The race course is a loop that is run 2.25 times. I've run it 1.25 times once, and 1 time around yesterday. If I keep the same pace, I should finish the half in 2:40 (it's my first - and we've established that I'm still slower than slow) but I hope that the atmosphere and adrenaline from the race will cut some time off of that. Honestly, even if I don't make it in 2:40 - I really just want to finish. I'm so excited to run in this race, but I'm also terrified. Terrified that I won't finish. That I'll be dead last. That I won't have any fun. I'm even terrified that the girls I'm running with will be mad they have to stay on the island until I finish. I know that I'm only psyching myself out, but I can't help it. I'm a really super excited kind of scared. I ran another race on Monday, since Labor Day provided me with a much needed day off of work. 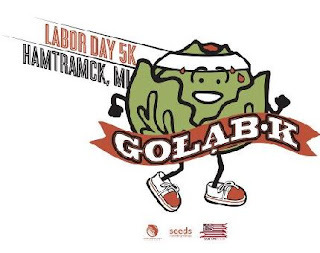 I wasn't going to run Golab K because I'm broke and decided that if I was going to race, I'd make it worth my while. I want at least two of my three critera to be met: 10K or longer distance, righteous shirt (preferably tech), medal. This race was none of the three, but like the good Polish girl that I am, I caved and registered about 4 minutes before Active closed registration. I should have saved the money. The race itself was pretty nice. Low cost, decent swag (a tote bag with a running cabbage on it isn't a tech shirt, but it still can't be beat) and in one of my most-loved cities on planted Earth, Hamtramck. I stunk up the entire course. Maybe the Crim with it's fancy swag and rowdy spectators spoiled me but nothing was really speaking to me on this particular day. My legs were killing me only a quarter mile in, I walked at least half the race because I was so desperately thirsty that my throat was sore and I tripped in pothole because I wasn't paying attention. Not everyday it our day, you know? And Monday was without a doubt not mine. Despite my outrageously poor showing, as long as Golab K is put on, I'm running it. The course was fun, running though main streets, back alleys, a football field and even for a short time on the Labor Day Parade route! We also pounded pavement past quite a few of my favorite bars and it took everything in me not to stop my sore legs, rip off my bib and pop in for a beer. The race was really (really) small - there wasn't even a marked start line! - and it was the perfect amount of campy and small town, just like I'd expect in Hamtramck. I was pretty pissed after crossing the finish line and just turned around to watch a few more runners cross the line and then went back to my car. I never stopped my GPS and I didn't stick around to see the race times posted, so I'm not sure of my actual time. This is probably for the best. I am officially signed up for two (2!) half marathons.